The Dividist Papers: Investors still love divided government. A lot. 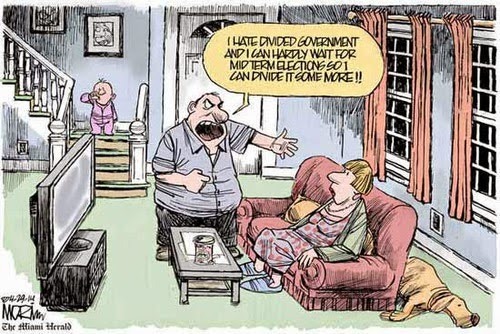 Investors still love divided government. A lot. Last July 7, we took note of CNBC's Amanda Drury worrying about double D's and Ron Insana offering an explanation for a stock market rally in the midst of unrelentingly bad economic news. On that day the Dow closed up 276 points at just over 10,000 with the S&P 500 up 30 at 1060. Since then, the Dow and the S&P have each added another 10%+. As I have said before, I do not believe there is any case for a statistical correlation between market direction and political parties in power that will stand up to rigorous mathematical scrutiny over the long term. However, in the short term, if investors believe that divided government is good for markets, then that expectation can be a self-fulfilling prophecy. That may be what we are seeing now in anticipation of the November results. Apparently the investor class really believes that divided government is good for the market. The most interesting exchange is between Goodfriend and Moore (around the 5:30 mark) arguing whether Republicans or Democrats could take credit for the prosperity and relative financial sanity that prevailed during the Clinton/Gingrich divided government. I am happy to give credit to both, and to the benefits that accrue when divided government keeps the worst impulses of both parties at bay. Is 2010 like 2006? Kudlow thinks so. Intrade is giving the Republicans better odds now than they gave the Democrats in 2006. 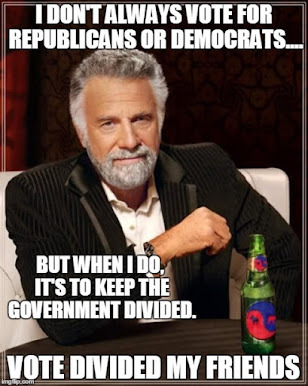 And the Dividist is fully invested.